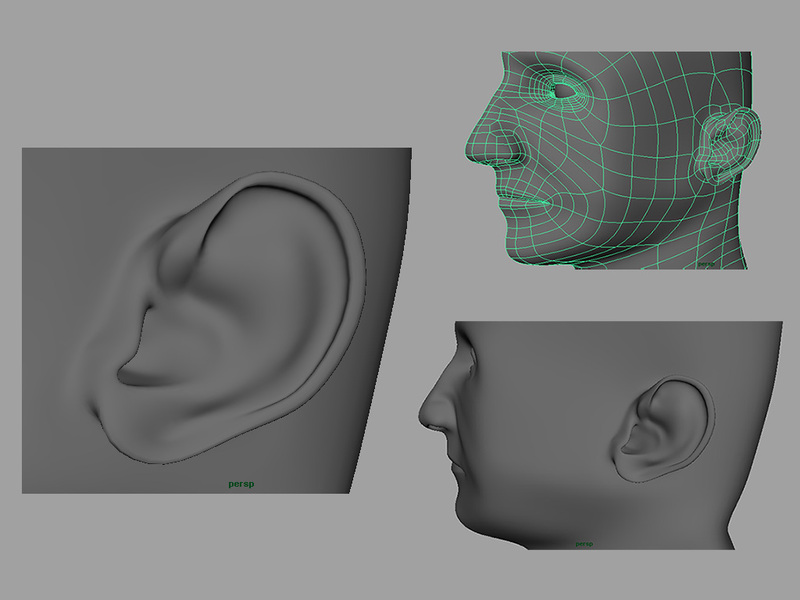 The process is to create a basic shape for the ear like a rectangular cube of sorts, and rotate it to the proper angle (reference is essential). Btw, the rectanglar cube thing is extruded out of the side of the head. That side is basically a merged face of poly's, on the side of the head. This rectangle is then extruded outward to give a basic block in for the ear shape. To this, the Polygon Split Tool (Maya) or Cut Tool (in 3DS Max) is used to almost "cookie cutter" the shapes of the ear. Be careful not to create tris when you do this, it is important to keep things clean and have four sided poly's as much as you can keep it. Shapes cut out include all the inner parts of the ear, as well as the flappy outer part of the ear. The flappy part of the ear is then modeled from the vertices which were cookie cuttered. The inner part of the ear is then extruded and moved downward into the ear, scaled down, and rotated, naturally trying to follow the curves of the ear as it spirals much like a funnel into the side of the head, where the ear drum is.